Monticello, NY - A tragic bungalow colony accident has claimed the life of a Toms River boy. The incident took place Thursday night at approximately 7:30 PM at Birchwood Estates in Monticello. Undersheriff Eric Chaboty said that four year old child was on his tricycle next to an ice cream truck that was visiting the colony when the truck began to move, clipping the bike’s wheels and dragging the child under the truck. 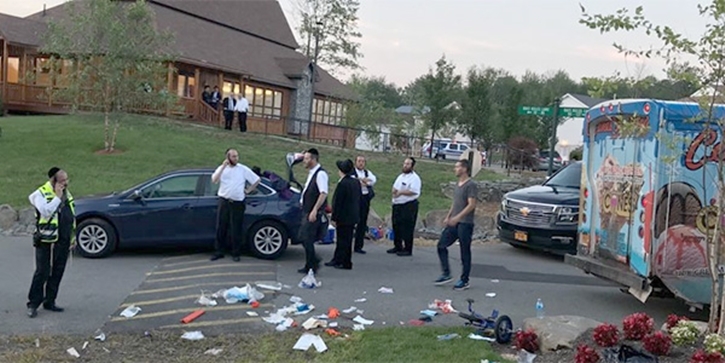 The child, identified as Shmuel Gellis of Toms River, was transported by Hatzolah to Catskill Regional Medical Scene where he was pronounced dead, reported the Times Herald Record. The driver of the ice cream truck remained at the scene and has not been cited for any wrongdoing at this time. The Sullivan County Sheriff’s Department, New York State Police’s accident reconstruction team, the Monticello Fire Department and Mobile Medic all responded to the accident scene. The investigation into the accident is still ongoing. Terrible. Hashem I beg you. The family, an amazing wonderful family should have a Nechama. Baruch dayan emes!! Oy heiliga bashefer!!!!! terrible, terrible news, no words.